info-beamer hosted works great on the Artista IoT board. All you need to do is flash the info-beamer hosted OS system image and power up your display! Hardware accelerated playback of FullHD videos. Perfectly smooth animations with full hardware support. A powerful web dashboard to manage one or thousands of devices. Automatic system and security updates. Programmatic control using APIs for complete automation. The most robust operating system with built-in self-healing. Download info-beamer hosted OS system image (img.gz) You must enable 'Show advanced options' on your account page to download the hosted OS in the img.gz format. Then on the above page, and select the img.gz format in the dropdown menu. Connect a mini-USB cable to the connector labeled USB BOOT, then flash the info-beamer hosted OS onto the Compute Module. 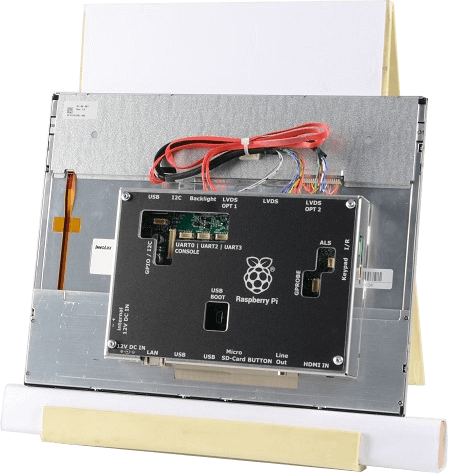 Follow the instructions on the Raspberry Pi documentation site to learn how that is done. Your Artista-IoT device is ready. Remove the USB cable and power cycle the device. info-beamer hosted is installed. That's all. Get in contact with support if you need help or have questions about using Artista IoT with info-beamer hosted.